Stink bugs and Leaf-footed bugs are frequently a problem in our area because they will damage the fruit, leaving behind inedible corky white spots. Soap sprays and neem oil can help in controlling the immature bugs (nymphs), but may not have always much of an effect on mature bugs. Bugs and nymphs should be removed from plants and squashed whenever you see them. They can also be knocked into a bucket of very soapy water, or vacuumed off using a hand-held vacuum. Solutions: Surround, a finely milled kaolin clay, can be mixed with water and sprayed onto the plants to repel them. Trap crops such as millet can sometimes be effective as stink bugs usually find those crops to be more attractive than tomatoes. 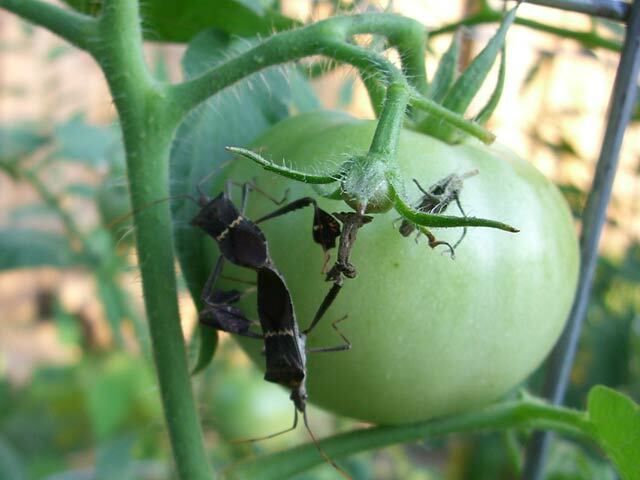 It’s much easier to see and collect stink bugs on millet then in the dense foliage of a tomato plant. Chemical controls for stink bugs include Ortho Bug-b-Gon Max (Bifenthrin) spray and Sevin (Carbaryl) spray or dust. Assassin Bugs — Friends, not Foes! Assassin Bugs are similar in appearance to leaf-footed or stink bugs from a distance, but have distinct differences in leg formation and other distinguishing characteristics. 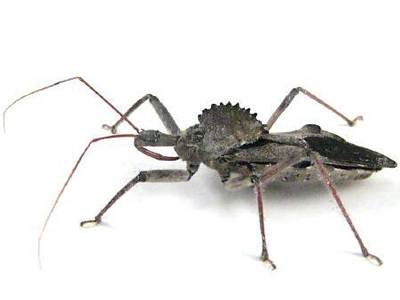 Wheel bugs, a type of assassin bug, have a serrated “wheel” protruding from the top of the thorax. 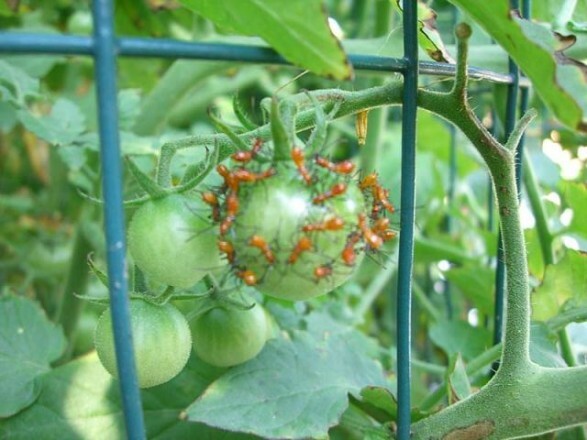 They are not harmful to your tomatoes, and are in fact a highly beneficial insect which will prey on many other insects in your garden. Assassin bugs usually travel alone which can be used to help identify them. Unfortunately their young nymphs look similar to leaf-footed and stink bug nymphs, so keep that in mind and attempt to make a proper ID before reaching for the pesticide bottle. NOTE: The bite of a wheel bug is extremely painful and can persist for days. Keep an eye out for Cornworms and Fruitworms, as they will tend to bore into the fruits and cause damage. 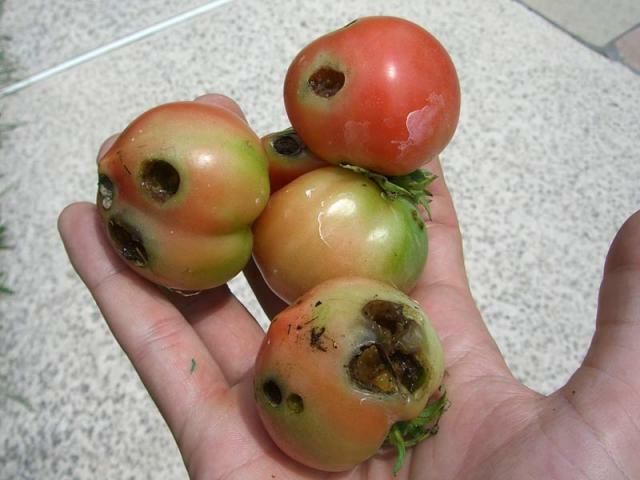 More often than not, fruitworms will eventually find your tomato plants. Thin out dense thickets of foliage where fruitworms hide and can do the most damage. Apply Bacillus Thuringiensis (see below) on a regular basis. B.T. (Bacillus Thuringiensis) is a bacterium which is ingested by caterpillars and worms and causes them to lose their appetite. It is sold either as a powder (Dipel Dust) or as a liquid concentrate (BT Worm Killer or Thuricide). Used early and regularly in the season, it will keep the population under control before they have a chance to multiply and do serious damage. BT, which has no effect on humans or animals, does not kill on contact, but instead is used as a preventative. Hornworms can eat an amazing amount of foliage relative to their size. 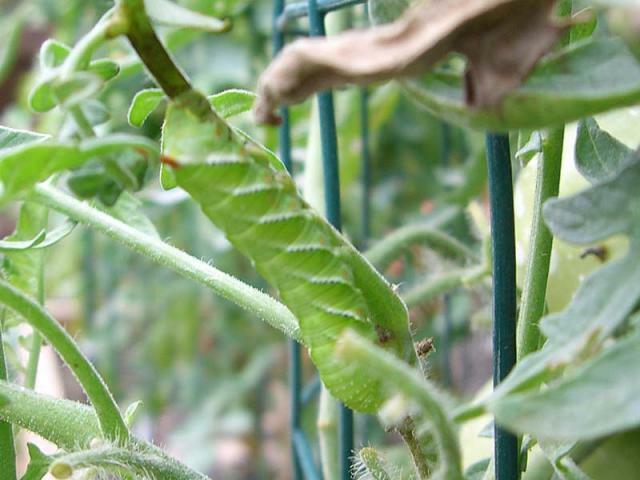 One tomato hornworm can eat half of a tomato plant per day. Apply Bacillus Thuringiensis on a regular basis and regularly inspect plants for hornworm activity (chewed leaves and the dark “frass” or droppings of this voracious worm. NOTE: If you find a hornworm that has been parasitized by Braconid wasps (white eggs on its back), leave it be, as these are beneficial wasps that will kill the hornworm before it does substantial damage. Both Spider Mites and Whiteflies can sometimes be a problem in home gardens. Spider mites are much more frequently seen during dry/drought years, or in the more arid areas of Texas. 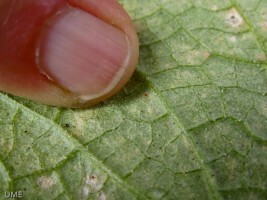 Both can usually be controlled with regular use of soap sprays or neem oil, but it is important to become familiar with the early signs of damage — dulling of foliage and/or rasping (tiny lighter spots on leaves) — so you can treat if necessary before the population gets a foothold and does major damage to your plants. A magnifying hand lens may be helpful in spotting them early on – look on the undersides of the leaves for moving dots and thin wispy webbing. We have found that severe spider mite infestations cannot always be effectively treated using soap sprays or neem oil. 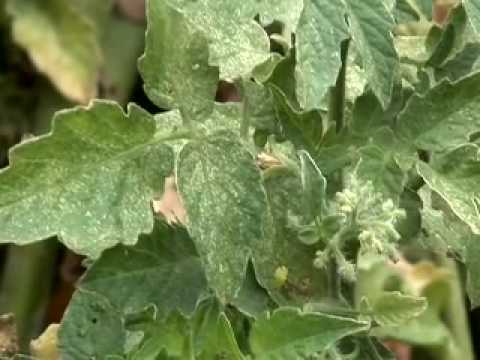 There is also the danger of soap and oils causing damage to tomato leaves which will be exposed to intense sunlight. Pyganic (pure pyrethrin) is an expensive concentrate which kills spider mites on contact. CAUTION: Overuse of the broad spectrum insecticide Sevin (carbaryl) has the potential to cause mite problems down the road, as it kills other insects that prey on them. Sevin is not effective against spider mites. You can end up with a double whammy effect by using it if your garden is prone to mite problems. Keep this in mind before reaching for the Sevin dust as a general all-purpose bug preventative.